Does Your Trade Show Booth Stand Out from the Crowd? 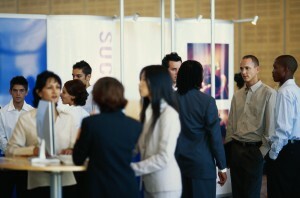 Deciding to attend a trade show is a huge decision for your business. It often includes months of planning and an immeasurable amount of effort. However, trade shows are a great way to boost your revenue and make connections, making all that planning worth it in the end. If you could alleviate some of the stress of planning your trade show booth, would you? There is a way – outsource matters like storage, set-up, and shipping to a professional expo logistics company and give yourself more time to focus on creating a trade show booth that really stands out from the crowd and boosts your company’s business. If you could alleviate some of the stress of planning your trade show booth, would you? Tips to Make Your Trade Show Booth Stand Out! Everybody loves free stuff and giving out freebies and prizes is a great way to catch the attention of people attending the trade show. Whether it’s cookies and coffee, pens with your company logo, or samples of your product – once you’ve gathered a crowd, it will be much easier to get them interested in your business. Games and contests work well too! Try to do something different that will catch people’s attention. Lighting, sound equipment, electronic presentations, signage, and posters are all no trouble at all for AFP Expo to deliver safely and on-time to your trade show – so don’t be afraid to go all out! No matter how big or fragile the display, you don’t need to worry about your exhibit arriving in one piece when you choose to use our expo logistics service. Picking the right people to staff your trade show booth is just as important as the booth itself. You want to choose staffers who represent your brand and who are knowledgeable about your business. An active and friendly team who isn’t afraid to talk to and approach people can make all the difference in marketing your business, as opposed to someone who waits for people to come up to them. This entry was posted on Wednesday, September 2nd, 2015	at 12:33 pm	and is filed under AFP Expo, Trade Shows	. You can follow any responses to this entry through the RSS 2.0	feed. Both comments and pings are currently closed.